[Immersion: /ɪˈməːʃ(ə)n/ the act of putting someone or something completely under liquid, or the deep mental involvement in something. ]Taking a deep dive into atmosp.. Taking a deep dive into atmospheric depths, Immersion is the debut soundset by the American psybient producer, Echo Season. 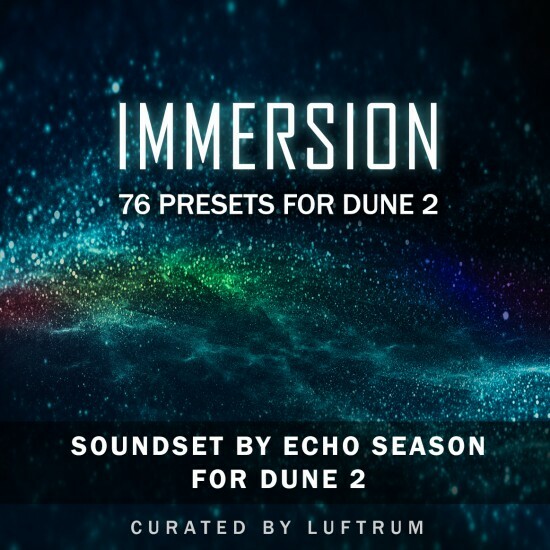 The soundset contains 76 inspiring sounds for DUNE 2, selected by and released exclusively on the Luftrum label. The included patches will set the tone for your next sonic excursion. Interstellar beds and nebulous lush pads await to be discovered by the intrepid spacefarer. Characterful plucks and crystalline keys will propel you through the cosmos. Deep subsonic bass underpins the works like a cold fusion engine core – all designed in the sonic range of artists such as Carbon Based Lifeforms, Ascendant, Solar Fields and Martin Nonstatic. Immersion takes full advantage of DUNE 2’s extensive modulation and layering capabilities and all patches are meticulously crafted with an intense focus on subtle detail. The sounds are calibrated between -2dB and -4dB and are ‘play-ready’ for your next mix. Many of the patches are massive in scope and can often supplant the need for additional synths when layering. Also included is a set of NKS presets, tagged and sorted in categories and types and with an added Immersion sub-bank to browse in. This is relevant if you are using Komplete Kontrol hardware and Machine hardware, by Native Instruments.